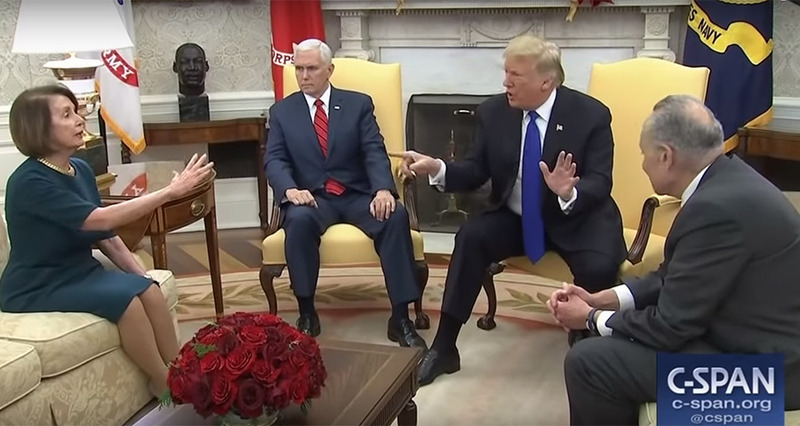 During a contentious meeting in the Oval Office on Dec. 11, President Trump and Democratic congressional leaders failed to reach an agreement on border security spending to avert a partial government shutdown. Funding expires on Friday for federal agencies that have not yet received their fiscal year 2019 appropriations. Since the beginning of the fiscal year on Oct. 1, these agencies have been operating on stopgap funding. Now, President Trump is saying he plans to follow through on his repeated threats to block any further spending legislation that does not include billions of dollars in border wall funding. However, he has also signaled he might be willing to postpone that fight until January. Congress could extend spending on its own if it is willing to override a presidential veto to prevent a partial government shutdown. Recent reports from the Capitol, however, suggest negotiations have ground to a halt. Among science funding agencies, the Department of Energy, Department of Defense, and National Institutes of Health would not be directly affected because they have already received their full-year appropriations. This week, the National Academies is convening the kickoff meeting of a new study focused on the detection of Near Earth Objects (NEOs). For 20 years, NASA has led a coordinated effort to locate objects that could catastrophically collide with Earth, such as asteroids and comets. The campaign to survey these objects has made considerable progress, but is not expected to meet its congressionally mandated schedule. Chaired by Purdue University planetary scientist Jay Melosh, the study committee will consider the relative advantages and disadvantages of searching for objects in the infrared and visible light spectra. Its conclusions could affect whether NASA moves forward with NEOCam, a proposed infrared space telescope and wide-field camera. The advisory committee for NASA’s Heliophysics Division is meeting Tuesday through Thursday in Washington, D.C. On Tuesday, agency officials will discuss a variety of issues, including the diversity of principal investigators funded by the division and matters related to high performance computing, data management, and open science. On Wednesday, discussions will turn to the division’s Living with a Star program, including the Geospace Dynamics Constellation mission concept recommended in the 2013 heliophysics decadal survey. The committee will also discuss preparations for the upcoming midterm review of the decadal survey. 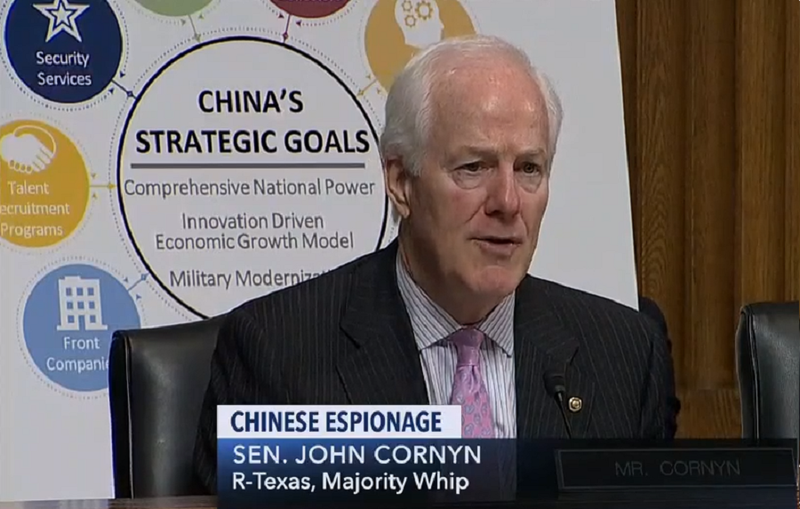 At a Dec. 12 hearing on “non-traditional” espionage, Senate Majority Whip John Cornyn used a chart produced by U.S. intelligence agencies to illustrate methods the Chinese government uses to acquire technology. At its Dec. 13 advisory committee meeting, NIH staff also provided an update on its efforts to prevent sexual harassment in research groups funded by the agency. Among its planned actions, NIH will conduct a survey of workplace climate within the agency and use the results, targeted for publication in mid-2019, to inform subsequent policy responses. NIH is also creating a Working Group on Sexual Harassment that will propose “system-wide changes to culture and climate to prevent harassment and gender discrimination,” among other actions. The group plans to issue a preliminary report by June 2019 and a full report by the end of 2019. President Trump announced on Dec. 15 that Interior Secretary Ryan Zinke will step aside at the end of the year. Zinke had become embroiled in a series of ethics investigations, though he has denied wrongdoing. During his time as secretary, the Department of the Interior has become a focus of concerns about scientific integrity. There have been a number of reports that department officials have actively discouraged employees from discussing climate change and other subjects. Last year, hundreds of employees of the U.S. Geological Survey, which is within the department, were blocked from attending the American Geophysical Union’s fall meeting. The department’s treatment of science is also broadly criticized in a recent report from the Union of Concerned Scientists, an advocacy organization. Zinke will be replaced on an acting basis by Deputy Interior Secretary David Bernhardt, a former oil industry lobbyist. In September, Bernhardt signed a directive that, once implemented, would require departmental agencies to privilege research with publicly available data when justifying new regulations. The proposal echoes a similar one at the Environmental Protection Agency that has been the subject of intense controversy. The American Geophysical Union held its annual meeting last week in Washington, D.C., drawing over 20,000 attendees, including a few members of Congress. In a keynote speech, Senate Energy and Natural Resources Committee Chair Lisa Murkowski (R-AK) spoke about the importance of preparing for natural hazards, highlighting the recent passage of the "National Earthquake Hazards Reduction Program Reauthorization Act" and two pending bills: the "National Volcano and Early Warning System Act" and the "National Landslide Preparedness Act." She also emphasized the negative impacts of climate change on Alaska and said she will be an advocate for geosciences in Congress, welcoming ideas on “everything from natural hazards to mineral security to climate change.” Murkowski concluded by acknowledging the problem of sexual harassment in the sciences, a topic also addressed later that day by Rep. Jackie Speier (D-CA) during a plenary session on the recent National Academies report on the subject. Speier said she plans to reintroduce legislation in the next Congress that would require institutions to report to federal funding agencies when grant awardees are found to have committed sexual harassment or assault. On Dec. 11, President Trump signed the “National Earthquake Hazards Reduction Program (NEHRP) Reauthorization Act” and the “Women in Aerospace Education Act” into law along with seven other bills. The NEHRP bill provides the first reauthorization for the interagency program since 2009, updating policy direction on earthquake research, preparedness, and mitigation. The aerospace education bill directs NASA to encourage the recruitment of women and individuals in underrepresented groups into internships and fellowships relevant to the aerospace sector. It also permits certain grants awarded by the National Science Foundation to support internships at NASA and national laboratories. Legislation to create a National Quantum Initiative took another leap toward the finish line last week as the Senate passed a modified version of the House’s bill by unanimous consent. If the House accepts the Senate amendment, the bill will head to President Trump for his signature. The Senate version retains the general structure of the House bill, creating a 10-year interagency effort in quantum information science and setting target funding levels for programs at the Department of Energy, National Science Foundation, and National Institute of Standards and Technology. The most significant difference between the bills is that the House version specifies the agencies “shall” expend the funds as directed, whereas the Senate version sets nonbinding funding targets. Agencies, in any case, have already begun to ramp up funding for quantum R&D. With Sen. Bill Nelson (D-FL) leaving Congress following his defeat in the November election, Sen. Maria Cantwell (D-WA) is claiming his spot as the ranking Democrat on the Commerce, Science, and Transportation Committee. The committee has jurisdiction over a number of science-supporting agencies, including NASA, the National Science Foundation, the National Oceanic and Atmospheric Administration, and the National Institute of Standards and Technology. Cantwell has been serving as ranking member on the Energy and Natural Resources Committee, which has jurisdiction over the Department of Energy and Department of the Interior. The top Democratic slot on that committee is now passing to Sen. Joe Manchin (D-WV). In a statement, Manchin said he will work in a bipartisan manner to develop an “all-of-the-above” energy policy and that he intends to ensure West Virginia remains a “leading energy producer and major contributor to advanced energy technologies.” A branch of the National Energy Technology Laboratory is located in Morgantown, West Virginia. Some Democrats expressed concern about Manchin gaining the position because of his support for fossil energy. On Dec. 13, Rep. Bill Foster (D-IL) announced he will co-chair the National Labs Caucus alongside Reps. Chuck Fleischmann (R-TN), Ben Ray Luján (D-NM), and Lee Zeldin (R-NY) when the 116th Congress convenes in January. Foster’s district is home to Argonne National Laboratory, and before his election to Congress, he was a physicist at nearby Fermilab. Rep. Randy Hultgren (R-IL), whose district is home to Fermilab, has played a leading role in the caucus alongside Luján since its establishment in 2012. However, he is now leaving Congress following his election loss to Democrat Lauren Underwood, a registered nurse. On Dec. 13, the National Academies released a long-term strategic plan for the Department of Energy’s fusion energy research program. It urges the U.S. to remain a partner in the multinational ITER fusion project and launch an R&D program directed at building a pilot fusion power plant in the U.S. To pursue both these paths, the panel expects the DOE Fusion Energy Sciences budget must be maintained at nearly $200 million above its current level for decades. The plan argues that withdrawing from ITER would isolate U.S. researchers from the international community and make it more costly to acquire the experience in controlling burning plasmas needed for a domestic fusion energy program. It also states that advances in technology will make it feasible in the coming decades to build a compact, “pre-commercial” power plant capable of generating net energy from burning plasma. On Dec. 12, the National Science Foundation released a solicitation for mid-scale research infrastructure projects costing between $20 million and $70 million. The new funding opportunity complements a solicitation released last month for mid-scale projects costing less than $20 million. Beyond the differing cost ranges, the latest solicitation is for proposed projects that are in “high states of readiness for implementation,” while the previous one can support design studies in addition to project implementation. The Department of Commerce has extended the public comment period for its advanced notice of proposed rulemaking on export controls for “emerging technologies” to Jan. 10, 2019. The department is considering trade restrictions on 14 technology areas of national strategic importance, including a range of advanced computing, manufacturing, and sensing technologies. The proposal follows from a provision in the latest National Defense Authorization Act, which President Trump signed into law in August. The Society of Physics Students is seeking applications from undergraduate physics students for two summer science policy internship programs sponsored by the American Institute of Physics. The AIP Mather Public Policy Internship program places two students in congressional offices, and FYI hires one student to assist with the production of science policy newsletters. Applications are due Jan. 15. The National Science and Technology Council Subcommittee on Quantum Information Science is accepting public comments to inform federal agency responses to policy recommendations in the “National Strategic Overview for Quantum Information Science,” which the White House released in September. Submissions are due Jan. 25, 2019. The National Science Foundation is hiring a director for the Graduate Education Division in its Directorate for Education and Human Resources. The division supports research on graduate education methods and administers the agency’s Graduate Research Fellowship, Research Traineeship, and CyberCorps programs. Applications are due Jan. 16, 2019. Could the UK really build its own global satnav system?